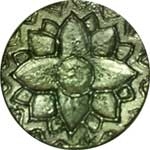 A datti is a pewter coin that facilitates a gift-based economy, just as a dollar facilitates a trade-based economy. The what's in the whosiewhat, you ask? Here's how a person might use a datti: Suppose you wake up one morning and decide to grow a farm in your back yard. Most of the food from that farm you're going to sell for good old dollar money, because we all have mortgages and cell phones and stuff like that. But suppose that you decide to give some of the crop from your farm as a gift? You may chose to give a datti coin away with the gift as well. The person to whom you gave this gift is now standing with kale in one hand and a beautiful coin in the other. And she conveniently happens to know exactly what to do with that coin! She creates a gift of her own-- maybe she knits a hat, or makes some soap, or fixes a bicycle, or offers childcare-- but when she's ready to give her gift, she gives it to someone else with the coin. She pays it forward. And this way, the coin passes from one hand to another, each time accompanying a beautiful gift. One day, that coin that you gave with your kale may just come back to you! And who knows? Maybe one day you'll wake up and realize that you're not using any of those pesky dollars anymore! Just giving and receiving gifts. If you have received a datti, then it is time for you to choose your gift and pay it forward.